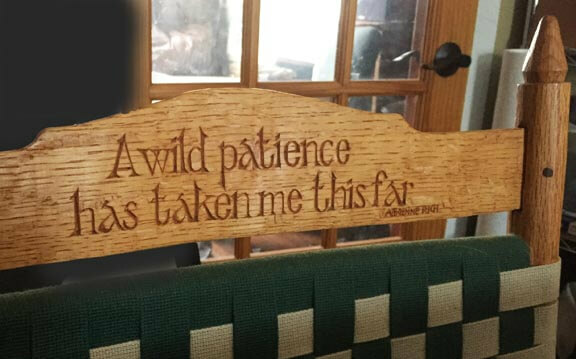 With appropriate nod of copyright credit to Adrienne Rich, I carved this quote on many a chair slat over the years. Today, as I begin my day in the studio office, it is a trusty touchstone. The entire rest of the studio, who am I kidding, the ENTIRE studio is in chaos. Stacks and piles of creative detritus have displaced any semblance of order and calm. Remember that bucolic “winter of hibernation” that I so piously settled into…well all that intense creative energy leaves mountains of not so creative debris in its wake unless you clean up after yourself. Which…I…do…not. Someday, very soon, there will be a reckoning. But here I come to find that it is already March. MARCH for goodness sake. The mantras of inward patience crash headlong into the outward pressures of deadlines for show dates and demands from galleries to provide new work…which is a stupendously wonderful place for an artist to be do not get me wrong…but hello…March ! This would be a good time to let you know that my summer show at the Granary Gallery has been moved up this year. I’ll be reminding you, and my own self, again, but for those who do make travel plans to join us for the openings I wanted you to have a heads up. The date this year will be July 12th. And that would account for the WILD part of the patience. One less week of prep time does mean I have to move some serious paint around now and I have been putting in some very long days and nights at the easel. I’ve got a new theme going this year, stay tuned, and, as the finished paintings begin to gather in the front corner of the studio, I have to laugh at those muses. While all around me is this insane mess and clutter…each of the panels, when I stop to look, has a quiet calm space and a slightly more muted palette which settles my eye and quiets my mind. 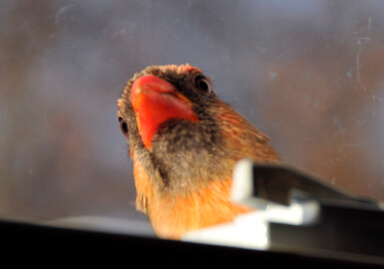 NO…it’s just Wolsey …ever and always my feathered muse.